Here is a write up I did for my 303overland facebook group on trail coms and what I did for my rig. Lets talk about Trail Communications. When you are out on the trail in a group or on your own having reliable communications can be the difference between having a great trip and loosing your life. I know that sounds severe however it could be true. That being said let me dial it back a bit and lets talk about the different types of devices and services most people use. 1. Everyone has a cell phone these days and they can be very useful for both communicating with others and getting help when needed. Unfortunately they are not very useful on the trail as you may or may not have service and you can only communicate with one person at a time. 2. You could carry some type of hand held radio that are readily purchased at walmart etc. these small radios work on the family radio service frequencies. They are a cheap and easy way to communicate with the group. The downside is the range is short they use batteries and they are useless in an emergency situation as you can not use them to reach emergency services. Along these lines are the gmrs radios that have the same limitations but have more power and require a license to use. 3. 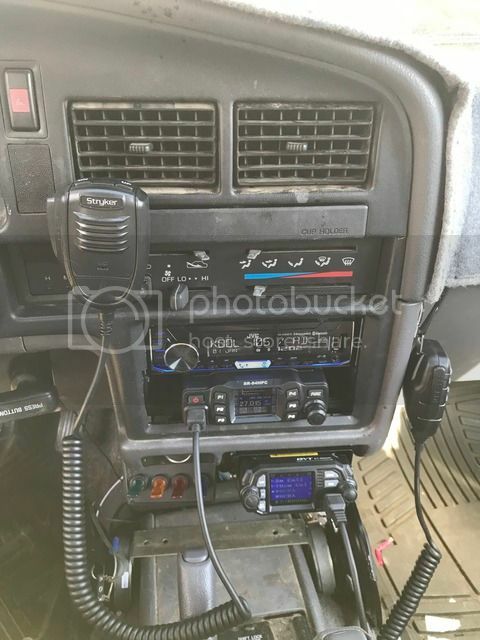 You could have a CB radio (long time go to for 4 wheeling) this is one of the most common radios you will find on the trail and have the benefits of the frs radios but do not have the battery limitations as they are normally installed in the vehicle. With larger antennas they can reach 3 to 10 miles depending on terrain. The downside is they are rarely monitored by emergency services so they don’t work will in an emergency. 4. You could have a ham radio (requires a license) these are becoming the go to for the off road community as they are more powerful have longer range are most time installed in a vehicle with a large antenna and through the repeater systems in most cases you can reach someone who can relay information to emergency services in an emergency. The limitation is that they are also like all the others line of sight radios and if you can not hit a repeater you are out of luck. 5. The newest addition to the field of communications is a satellite texting radio like the garmin inreach and now the new spot radios. These send 2way text messages direct through the iridium satellite service. They work great for one on one communications over distance where cell service is not available and as a bonus have an sos function that will call for help from emergency services anywhere in the world. The down side is they are not useful for group communication, carry a subscription fee and cost between 300.00 and 600.00. So what do you do? Well the best thing is to use a combination of radios. In my truck I have multiple radios that cover all of the items discussed above. Just under the stereo in the truck I have a 10m ham radio that also has the ability to transmit and receive AM CB frequencies this gives me the ability to transmit on both 27mhz am cb frequencies and talk with people who have cb radios but also use the 10m HF frequencies that can transmit long distances. Directly below that radio i have a 2m/70cm Ham radio that also has the ability to transmit at low power on the fmrs and gmrs frequencies. This gives me the ability to hit the most common repeater frequencies as well as communicate with other ham operators on those bands. These two radios cover all of the types of communications that I discussed above except for the satellite. I also have an inreach that I bring along just for emergencies or in case someone at home has an emergency and they need to get ahold of me. I am not saying you need all of these items but you at least need something that will allow you to communicate with your group, and for sure something reliable like the inreach so you can get help wherever you are. I have a hand held Ham (longer antenna) but the battery is not very dependable and seems to stop operating at the most inconvenient times, Also a CB that is hand held but plugs into the vehicle power. A wired in Ham in the vehicle and a cell phone, not always reliable for terrain and tower location reasons. I have now come to rely on the Ham, mostly as shouting out the window to the rest of the group is a bit awkward. It is not difficult to get licensed, by the way.